After every vacation I like sending my friends pictures from the trip. There are a number of options these days where you can upload pictures to a website and share a link. Here’s how you shrink your photographs using iPhoto. I’m assuming you have already imported some photographs into iPhoto. Select the photograph you want to shrink. You can do this for more than one photograph. To select more photos hold down the Cmd or Apple key on your keyboard while select the other photographs. 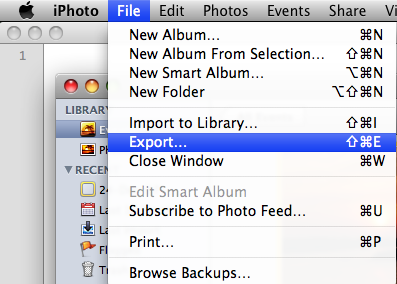 Now click on the File option in the iPhoto menu, then select the Export option. The Export window will now pop up. Select the File Export tab in this window. You will now see a number of options here. The first drop down titled Kind is to pick the format you want to export the file in. A few formats are supported. Select the format you prefer. I like to use JPEG. 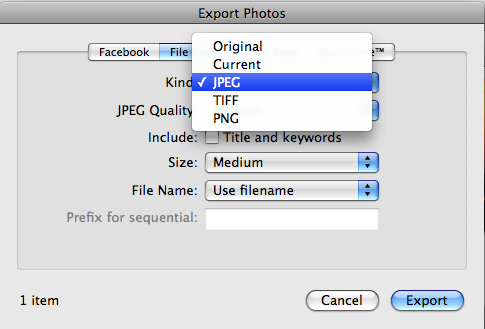 If you pick JPEG you need to configure two more parameters. The first the JPEG Quality, and the second is the file Size. 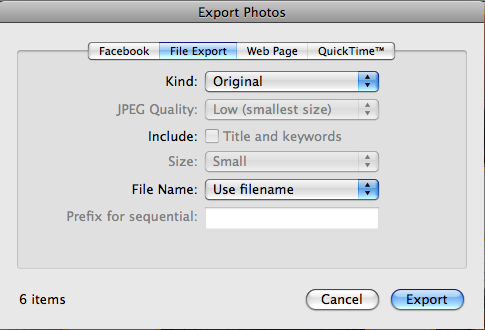 The first option will reduce the quality of the image while the second option will just compress the file. I suggest you play with the options and figure out what works for you. 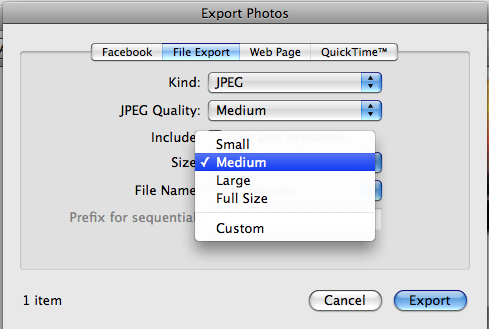 What I usually do is I pick Medium for both the JPEG Quality as well as the Size. It’s usually a safe bet. If you want to reduce or increase the level of file compression offered by default or crop the image you can pick the custom option in the Size drop down menu. 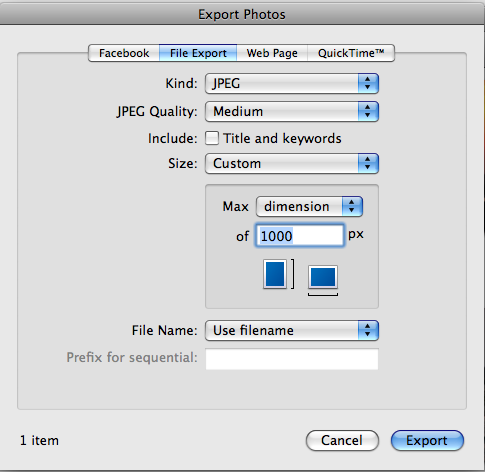 Aside from shrinking the images you can also use a common set of file names for the images you export. This is quite useful if you want to create thumbnails of photographs. Once you are done playing with the shrinking and file naming options it’s time to wrap up. Click on the Export button at the bottom of the window. A Finder window will pop up asking you where you want to save the new files. Pick the location and click on OK. Your photographs are now all shrunk and ready for your mail, or for your website.